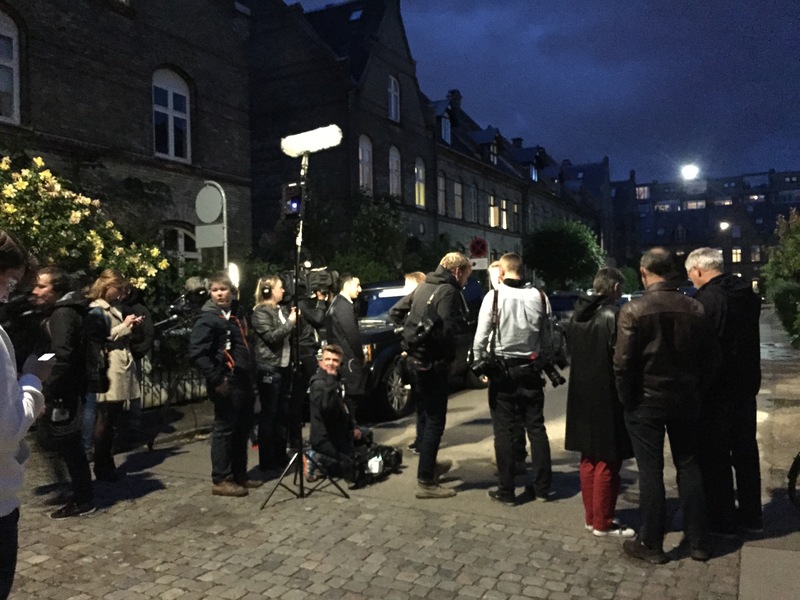 Last night I was walking home from a friend’s place one street over from Helle Thorning-Schmidt’s house and spotted the assembled media of Denmark (so two TV crews and a handful of photographers) outside her house. After chatting with the TV2 cameraman (who usually works on movies but they needed so many extra camera crews he was drafted in) I found out the Prime Minister was home and they were waiting for her to leave once the count was decided. Usually she stops for a wave and a few words before being whisked off the Christiansborg in her black Range Rover. My friends all headed home almost immediately but I am a sucker for a historic moment and I stuck it out for an hour and a half until my fingers were too cold and my husband sent me a text asking if I’d been invited in for tea or been arrested. I saw the photos of her leaving in the papers this morning and you can bet it was minutes after I turned the corner. Whilst standing there and chatting to a few of the other people also hanging around for a glimpse, I was reminded of how different life is here. An Indian couple I was talking to said they were there as in their country you only ever see your PM on TV, a lot like the UK. Another woman who lived in the street said that she supported Helle politically but also because she was a real part of that community, always coming along to the annual street flea market. A local character called Jørn, puffing on his pipe, was just there for the craic. A Danish mum of my age who had lived in Glasgow for a long while, posed for the photographers with her little dog and she joked it must be a slow news night for her to be focus of attention. There were about another 15 people and that was it. A police van cruised by but didn’t stick around, a couple of officers came out for a chat with the news presenters and moved them about on inch back. Helicopters hovered overhead but then the police here seem to love using these toys. The road wasn’t even officially closed. It was a friendly atmosphere, no negativity, no jostling media, just a few people hoping for a moment to see a remarkable woman leaving for her job, as it turned out for the last time. I am sad I couldn’t add my vote yesterday, frustrated that a political system sees the party and the leader with the most votes lose because of coalition or block politics, also sad to see yet another country’s voters moving towards more right-wing politicians. So today we have a new Prime Minister – although there is still some debate as it who that will be but it won’t be Helle. And time will tell what impact this and the popularity of the Dansk Folkeparti will have on life here. So to end on an observation from a very 21st century child. When I explained how the election was decided my son declared it far too complicated (very true) and when I showed him a picture of Lars Løkke Rasmussen he said “How can he be Prime Minister, he’s a man!” Farewell Helle! Hope to see you in Irma again soon. Love your son’s comment. My eldest got to vote (in Britain) for the first time in May. It’s great to get children interested in politics. It is interesting explaining political systems to a five year old. After the UK election which was relatively easy to understand the Danish system was a bit baffling, but to give him credit he did a good job of getting it.